Fact: You’re probably going to spend somewhere between $8,000 and $12,000 on your air conditioning system (based on a single storey average sized home). So if you’re going to spend that kind of money, you’re going to want a system that works and provides you with the comfort and convenience you deserve. MyAir not only provides your family comfort all year long, but helps you save on installation and running costs. So if you’re after the most cost-efficient AC system possible that will save you money later down the track, there really is no comparison to MyAir. Here’s 4 of the fantastic benefits you can expect from MyAir, the smart AC system, over standard systems on the market. From an energy saving perspective, the more zones the better. Consider a home with 4 occupants in it for example. The average home has 10 rooms and the standard air conditioning system has 1 zone, 2 zones, 3 zones or 4 zones (on the rare occasion). This means you end up with multiple rooms in each zone. So if 4 people are home and everyone is using a different zone, you have to run the air con to the whole house, even though only a few rooms are being used, which adds up to wasted energy. A good example of this is the standard 4×2 home, where the back 3 bedrooms are all grouped together on 1 zone. While 2 of these rooms might be the kids’ bedrooms, one of these might be a guest room that’s hardly ever used. But if you wanted air con in the other 2 rooms, you’ll be paying to air condition that guest room as well. But MyAir is different. 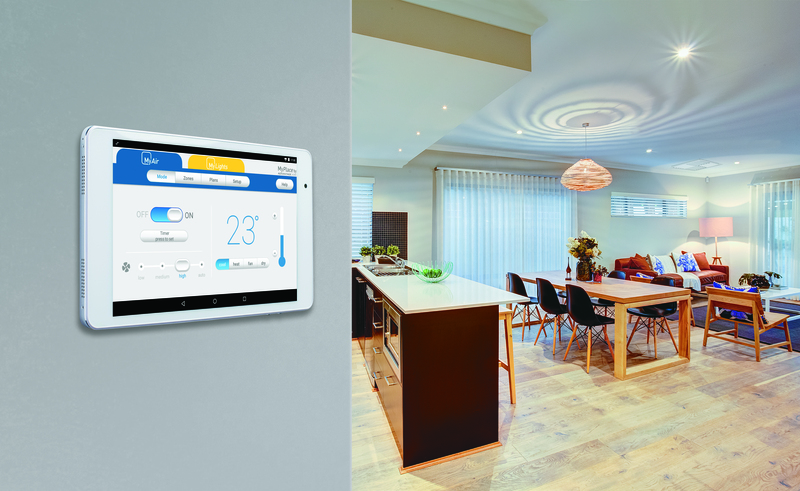 With 10 zones as standard, our system allows you to zone every room in your home independently, so you only air condition the rooms that you’re using and keep your energy bills at a comfortable price. Speaking of comfort, consider the same back bedrooms on the standard AC system: One has a window facing west, the other facing east. As the sun rises on a warm summer’s morning, the east facing room heats up. So the occupant of that room turns that back bedroom’s zone on. The west facing bedroom is nowhere near as hot, but has to receive the same level of air conditioning as the east facing room because they’re on the same zone. One room is comfortable while one room is freezing. And then in the afternoon, the opposite is true. All of this over air conditioning is consuming excessive electricity and costing you precious dollars. But it’s also frustrating and infringing on your comfort. With MyAir, you zone each room independently. Therefore, in this scenario, both occupants of those rooms will be comfortable and happy. Unlike standard ACs, MyAir looks out for your comfort AND your electricity bill, by dividing your home into 10 zones – one for every room. This allows you to heat or cool only the rooms you’re using. And with today’s steep power prices, I’m sure we can all agree this is an astronomical waste of money. Now let’s talk about airflow control. You might be wondering why this matters, but trust us – airflow should always be taken into consideration when deciding on a AC system. Why? Because not every room in your home is created equal. This means there can be huge temperature discrepancies between rooms, depending on orientation to the sun and whether they’re upstairs or downstairs. The problem with standard ducted AC systems is they don’t come with individual airflow control. This means the air is either ON or OFF in a particular zone – there’s no happy medium. Hot and cold spots are therefore unavoidable as they only have one thermostat, with no option to adjust the airflow to each room. Again, let’s look at the example with the 3 back bedrooms. One room is closer to the unit than the other 2. So naturally, the closer one will receive more air than the other 2. Again, one room freezes while the others swelter. With MyAir, you can control not only whether your room’s AC is ON or OFF, but also the amount of air it receives – in 5% increments from 0% to 100% to be exact. This gives you tighter control over your heating and cooling by taking you closer to your desired comfort level. Then for further comfort, why not add temperature sensors? If you prefer everything to be adjusted automatically, MyAir’s optional Individual Temperature Control (ITC) is the perfect added feature for you. Each ITC sensor is like a thermostat, giving you individual room temperature control. They instruct the system to continually adjust the airflow to maintain your selected temperature, which enables you to “set and forget”. Simply find your ideal temperature, set it, then let the MyAir system do all of the work for you so you can get on with the more important things in life. We particularly recommend installing ITC in the hotter west facing or upstairs rooms to ensure they stay the temperature you want as the day heats up. These sensors can be installed in as many rooms as you like, either at the time of installation or later on. And as ITC sensors ensure you won’t be over air conditioning rooms, they have the added bonus of saving energy. As mentioned above, the standard AC system only has 1-4 zones as opposed to MyAir’s 10. That means you can expect around 20% of your home to be unnecessarily air conditioned at any one time when you choose a system – that isn’t MyAir. And if you’re saving approximately 20% with MyAir’s zones, that’s $350 a year. This adds up over time. Each degree on an AC thermostat costs 10% in running costs. 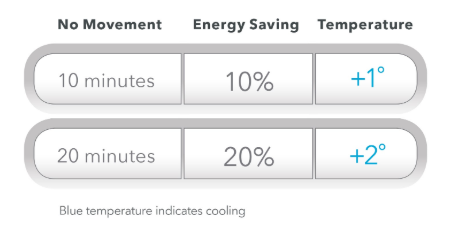 Without temperature sensors, it would be reasonable to assume a room could be over cooled by 2 degrees, which equals 20%. This means at any one time, 25% of your home could be over air conditioned and you’re wasting 5% of the total capacity of the AC. As well as ITC sensors, MyAir also has the option to add motion sensors. Motion sensors detect when a room has been empty for 10 minutes and automatically adjusts the target temperature by 1 degree. If the room is still empty after 20 minutes, the temperature is adjusted by 2 degrees. This small adjustment reduces the room’s energy usage by 20%. Then, when you re-enter the room it will return to your original target temperature. So if the annual running costs for your AC are $1,800, then you can expect to save a further $90 per annum with temperature sensors. An average ducted system zoned correctly with temperature sensors will save almost $450 per year in running costs. How much more is it to add MyAir to your AC quote and how long will the AC last? We bet MyAir pays for itself about 3 times over. And you will have superior comfort that whole time. Let that sink in – a better system that’s actually cheaper! Typically, this could save approximately $500 off initial costs and saves a further $50 to annual running cost savings. You do the maths. That’s a lot of savings with very little effort. Based on our calculations, MyAir saves your $500 per year in running costs & $500 in upfront equipment costs. This means MyAir pays for itself over time. This is difficult to achieve with a standard system and you might even find yourself in the negative over time. So why not spend a little bit more in the beginning, save a heap more in the long run and maximise your investment in your home and yourself? We’re sure you don’t drive the cheapest car or wear the cheapest clothes. So why would you want the cheapest air conditioning system if it meant the difference between a good night’s sleep and not? Take all this into consideration when comparing quotes and make a long-term investment for your home by choosing MyAir – the superior cooling solution. Talk to Advantage Air for practical & expert air conditioning advice.